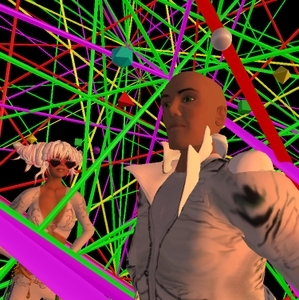 Last weekend a candy-colored platinum blond named Wizard Gynoid stood in Second Life space, while a latticework of colored lines that describe the entire known universe were drawn around her. After some time, she was joined by a tall bald man in a white robe named Garrett Netizen. Some courtesies were exchanged, and Mr. Netizen surveyed the multi-colored latticework that started to surround them. "Kind of looks like the inside of my head," he observed. Which as it turns out, was quite true. In between frequent stints on Maui's waves and Tahoe's slopes, and answering that whole ticklish fundamental question to all existence, Lisi occasionally visits Second Life. "I first tried out Second Life at the SIGGRAPH conference in San Diego in 2003," he tells me by e-mail. "I step my toe in every now and then to see how it's progressing." Usually too consumed in real physics, he adds, "This last visit was inspired by Wizzy's invitation." Which brings us back to the platinum blond with the "Wizzy" navel ring glinting from her exposed midriff. 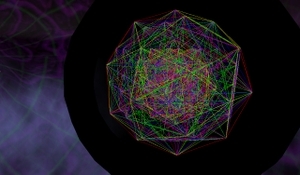 What she created in Second Life and wanted to show Lisi was an E8 Polytope, an extraordinarily complex algebraic system geometrically represented as a kind of fragile, intricate crystal sphere. In Lisi's "Theory of Everything", the E8 Polytope is the framework which explains the working of all known physical particles. A former philosophy of science student, Ms. Gynoid and her colleagues created a Second Life scripting system that converts all the vertices of E8 into thousands of multi-colored fiber, which constantly draw and re-draw themselves. "The full color is the whole object," she tells me. "It cycles through subsets of the object. Each color is a set of strut lengths." So last Sunday, Wizard Gynoid held the official opening of her E8 Polytope model, which floats in the inky blackness of Rezzable Visions. (Direct SLURL teleport at this link.) By the time I arrived, near a dozen avatars were there, furiously discussing the math and physics of her project. Shortly after I got there, Lisi himself showed up. Which from one point of view, is sort of like Einstein wandering through a museum diorama about general relativity. Jopsy Pendragon: An E8 works better than an E12 ? Garrett Netizen: E12's an infinite Lie algebra, so that would take too many prims. Wizard Gynoid: E8 is not infinite? it's finite? Garrett Netizen: 'xactly. That's right, E8 is a finite dimensional Lie algebra -- 248 to be exact. Helium3 Blister: Continuity of spacetime-- yeah or nay ? Garrett Netizen: Well He3, it's continuous in an interesting way, because of quantum mechanics. JeanPierre Euler: I like 4-dimensional E8 manifold , where the same thing sits in the intersection form. Garrett Netizen: JeanPierre, that's a good observation. Since the E8 polytope lives in eight dimensions, the projection down to four is in many ways more natural than the projection to three. I ask Lisi if being immersed within a virtual world realization of his theory provided him with any new or unique insights into it. "Mostly it's fun," he tells me. "But it gives a good idea of the complexity and beauty of the object. The visualization does make a lot of things clear that took mathematicians a long time to figure out; such as all the other polytopes hiding in this one." Wizard Gynoid concurs. 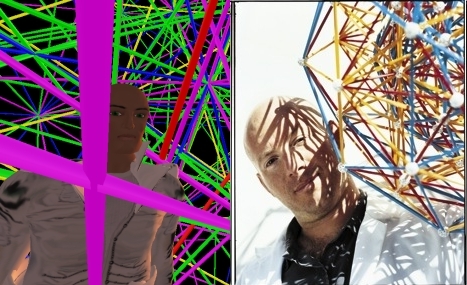 Exploring the model in 3D, as avatars, she argues, "[G]ives one a much clearer impression of the character of the structure than a mere 2D photo or image. Here we can walk into the structure. We can pan our camera around it. We can take in the various axes, and see the different elegant symmetries." Whatever its educational use, Lisi came away impressed by her effort, and the potential of the platform. "She's done a nice job of reconstructing a 3D model in Second Life of the eight dimensional E8 polytope, and displaying it in the context of other geometric structures," he e-mails me. 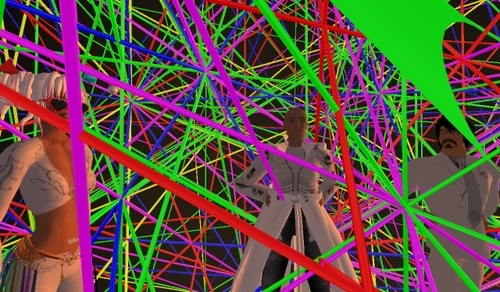 "I do think Second Life is a great environment for displaying and exploring this beautiful mathematical structure, and it's good to see it happen. I haven't spent a lot of time in SL, but there's a lot of wonderfully creative stuff going on, and I'll spend more time with it when I can." Inside the metaverse, the E8 model of Wizard Gynoid keeps assembling itself serenely, in perfect rainbow symmetry, a thing of beauty in itself-- and, perhaps, a way of making sense out of the careening material world outside. "To me the importance of [the] theory is, if proven out, that the universe is an elegant and orderly and beautiful place," Ms. Gynoid tells me. "Not a chaotic and disorderly one." What is the E8 Polytope? A “Polytope” is a higher dimension polyhedron and the E8 Polytope lives in the 8th Dimension. Our minds can't intuit what an eight-dimensional object looks like, but we can perceive its two and three-dimensional “shadows.” The shadows of the E8 are stunningly symmetrical and exceedingly beautiful. This is because the object encodes the Golden Ratio. All of the polyhedra on display here were found inside the E8 structure and share in its Icosahedral Symmetry. Why are we interested in the E8 Polytope? The E8 seems to be an accurate geometric model for Everything - from snowflake, ice and crystal formation to predicting the behavior of sub-atomic particles. The E8 is used in String Theory and is used to predict particle behavior in the new CERN Hadron Super-Collider. In March of 2007, Mathematicians from the American Institure of Mathematics (AIM) completed the five year project of mapping the E8. Dr. Garrett Lisi's new "Theory of Everything" (is this the long sought-after Unified Theory?) uses the geometry of the E8 to predict the behavior of ALL known particles, plus he predicts the discovery of twenty new particles... [W]atch a video that explains Dr. Lisi's new theory! And now the E8 Polytope comes to Second Life ! Thanks to Desdemona Enfield for programming and scripting assistance with the E8 Polytope Project. Thanks to Talia Takugawa and Poid Mahovlich for their patience. Thanks to Glyph Graves, xenophile Neurocam, Nand Nerd and Bhikkhu Kamachi for their support and assistance. Thanks to Scott Vorthmann for modeling. Thanks to all my builder friends here in SL (too numerous to mention). And especial thanks to RightAsRain Rimbaud! Way cool! Try all the perspective seats that are provided around the exhibit area to allow you to see the various symmetries. Sit long enough to see the patterns cycle. The separation of colors really elucidates the components of the structure. Great collaborative effort here between Wizard Gynoid and another exceptional SL artist, Glyph Graves . The SL model looks a lot better than the one in the pic next too garrett. SL is such a cool medium for this sort of thing. I thought this was a hoax? E8 can be thought of as the symmetries of a huge snowflake living in 248-dimensional space. Lisi believed that inside this he could bind the symmetries of the quantum world and relativity. Unfortunately, the consensus, after investigation, is that it is impossible to use E8 in the way Lisi was hoping and produce a consistent model that reflects reality. Lisi has been riding a wave - but it is time to knock him off his board and recognise that we are still waiting for the next Einstein to span the gap between the symmetries of the very small and the very big.